It is no wonder that glass has been used for almost two millennia in the construction of buildings - it allows light into the interior spaces, it provides insulation from the elements, and it can be a useful and versatile design element. In modern office building, glass provides the tenants dramatic views of city skylines, and provides building managers large headaches. Complaints from tenants that their windows are never clean are constant, no matter how many times the window washer cleans them. The photo at right is a great example. 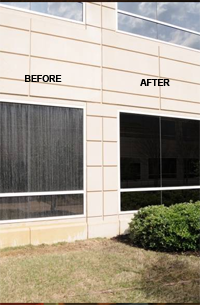 The building owner of this brand new office park began to receive complaints from tenants about dirty windows. His solution was to have a contractor pressure wash and squeegee the windows every other month. Only the problem didn’t go away, it got worse. Alkalis in the unsealed pre-cast panels, released by near constant pressure-washing, ran down the glass burned an etch into the glass. The solution in this case is to apply a penetrating sealer to the pre-cast, to stop the alkali run-off. Once that is done, the etching is removed by machine polishing with an optical grade polishing compound. The results in this case are evident in the photo. Restoration and polishing of glass is a job best left to experts in the field. 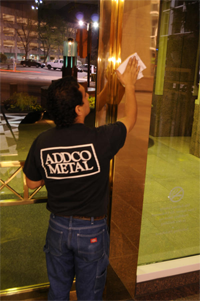 Improper chemical cleaning or polishing can permanently damage glass, when applied incorrectly.